The Fistula Care Plus (FC+) Project is a five-year global project supported by the USAID Offices of Population and Reproductive Health, and Maternal and Child Health and Nutrition. The project is designed to prevent, detect, and treat obstetric fistula. The purpose of this evaluation is to identify strengths and weaknesses of the project, as well opportunities for fistula programming beyond the life of the current project, including: 1) the extent FC+ has supported country ownership of fistula programming; 2) contributions FC+ has made to global leadership, advancing research and innovation, and transferring new technologies to the field; 3) the effects of management changes on the project; and 4) if FC+ is on track to achieve its objectives. 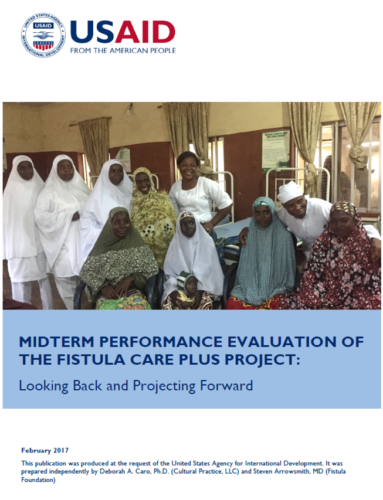 The evaluation used a mixed method approach, including document and indicator data review, surveys of USAID Mission staff and nurses involved in post-operative fistula care, interviews with key stakeholders, and focus groups with post-operative fistula patients. The evaluation found that the project has contributed significantly to country ownership, particularly related to detection, treatment, and prevention. FC+ plays a key role in global leadership on the issues of safe surgery, with a concern both for apparent increases in iatrogenic fistula and to improve fistula and prolapse surgical outcomes. Despite early changes in personnel, there was a smooth transition, and the project stakeholders stated they were unaffected by these changes. Furthermore, the project is on track to meet its objectives, but it could begin to build upon its strong model to expand its focus on causes and treatment of incontinence in women more broadly. This document is available online. Online documents can be located on the GH Pro website at http://ghpro.dexisonline.com/reports-publications. Documents are also made available through the Development Experience Clearinghouse (http://dec.usaid.gov).